Hello. My name is Oxley. 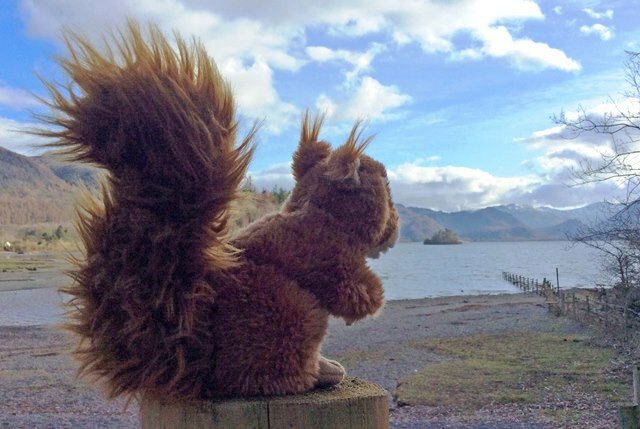 I’m a red squirrel and live at Underscar near Keswick. Now and again I’m taken out for the day by children who come to stay in this wonderful place and they write about our adventures together. This time I was lucky enough to accompany Zoe, the Quirky Traveller, and her friend Liz, who were staying in Grisedale, Cottage 14, at Underscar holiday homes. 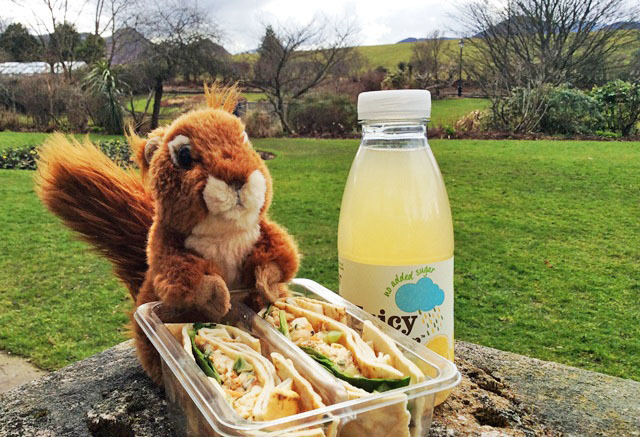 We headed out in the car to Keswick and the girls bought sandwiches for lunch from what turned out to be one of the few independent stores selling Co-op produce in the country – the Lakes and Dales Co-operative (most are in Scotland, a country which has wanted to be independent for years!). We then went on a walkabout to see what Keswick had to offer. There is a tall tower in the middle of Keswick, called the Moot Hall, which houses the Keswick Tourist Information Office. 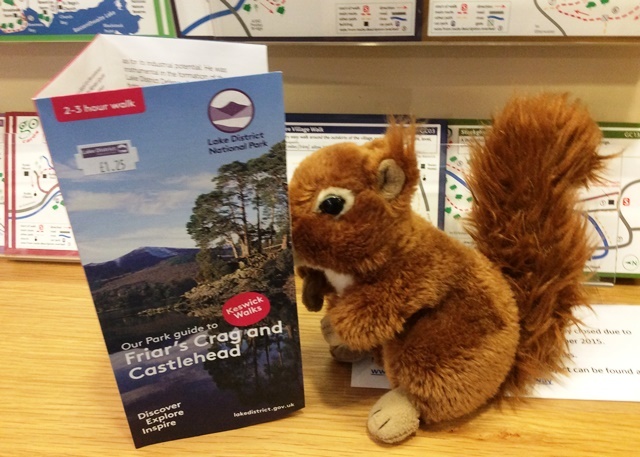 Inside, there are a lot of leaflets which explain where you could go for really interesting walks. They also sells discounted tickets for the Derwentwater Lake Cruises! 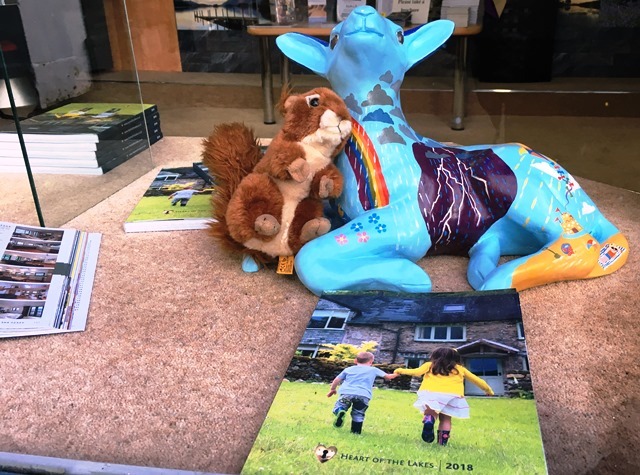 In John Young Furnishings I met some old friends including Mr Tod the fox and at Heart of the Lakes, which manages Underscar where I live, I got up close to a very pretty baby sheep. By this time we were getting hungry so we parked the car near Derwentwater and walked into Hope Park to eat our lunch. It’s a very pretty park with lots of benches, flowers and even an old bandstand! The pigeons were very interested in our food so Zoe threw them some bits of bread, which they ate very fast. After this, we went to the Theatre by the Lake to hear a talk about Hadrian’s Wall. 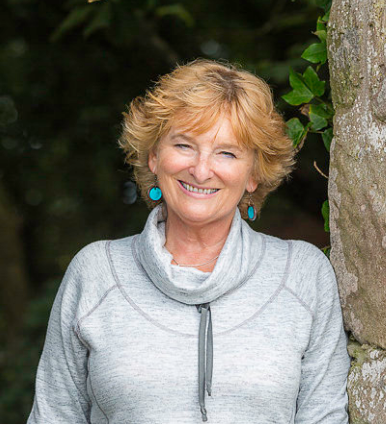 This talk was part of Keswick’s annual Literary Festival: Words by the Water. 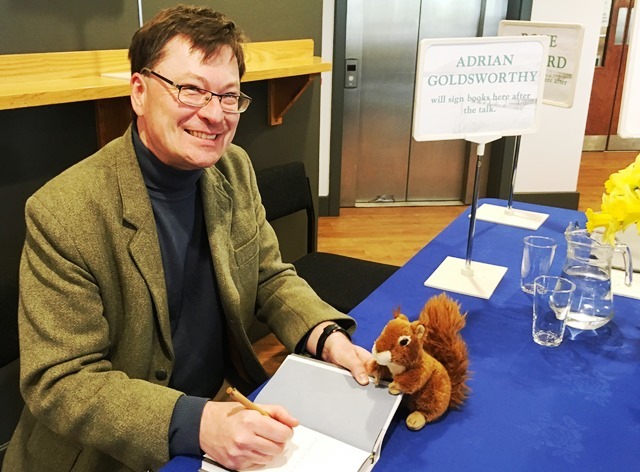 A man called Adrian Goldsworthy explained how it took 10 years and thousands of Roman soldiers to build the 73 miles of Hadrian’s Wall, which stretches from Northumberland in the east to the Solway Firth on the west coast of England. They still don’t really know why the wall was built. He was very knowledgeable and a very nice man and didn’t mind having his photograph taken with me. 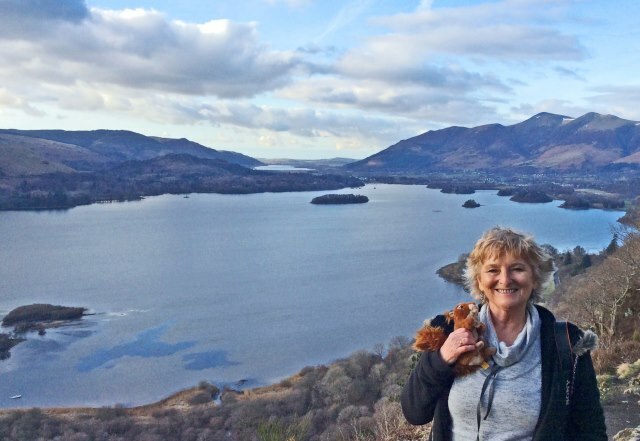 Even though the children take me out on trips, I get a bit nostalgic for the places I used to visit with Miss Beatrix Potter, so after we’d spoken to Mr Goldsworthy, Zoe, Liz and I walked beside Derwentwater, one of the most beautiful Lake District lakes and onto Friar’s Crag. From there I could see Owl Island, where my cousins and I collected nuts all those years ago. Luckily I didn’t see the owl, Old Brown; Squirrel Nutkin lost his tail to that owl. He was a VERY cheeky red squirrel! 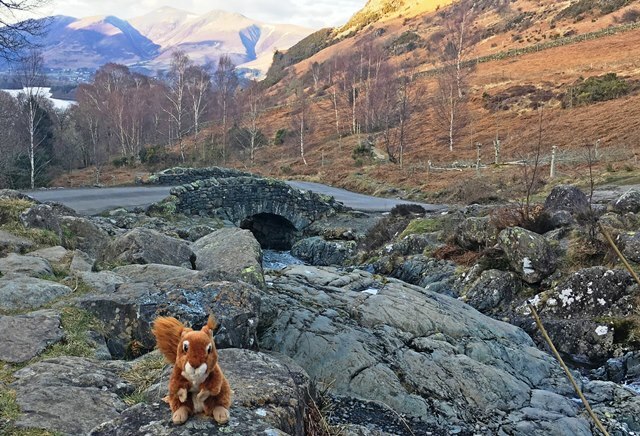 Liz had never seen Ashness Bridge, which is one of the Lake District’s oldest stone bridges, so we went there next. The bridge is very narrow and nearby there are lots of stones and rocks on which you can climb – and the waterfall is very pretty. Just up the road is Surprise View – and it is a huge surprise to see all of Derwentwater, with Bassenthwaite in the distance and even the Solway Firth on the horizon. If you’re lucky you may also see one of my relatives in the woods; quite a few red squirrels live here. By this time, the girls were getting hungry again so we started to walk back to the main square in Keswick. 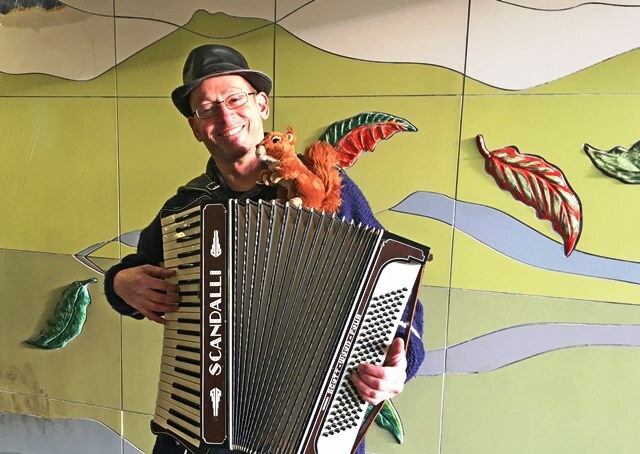 On the way, we met a man with an accordion called Rob, who was playing some very jolly music. He was very pleased to have his photograph taken with me and I think the girls would have liked to have danced with him but they needed something to eat. We decided to try the Inn on the Square in the heart of Keswick. The girls had a special treat; Chateaubriand fillet steak at the Brossen Steakhouse, which they said was absolutely delicious. I didn’t think so, as I just eat nuts, so I watched until they had finished. 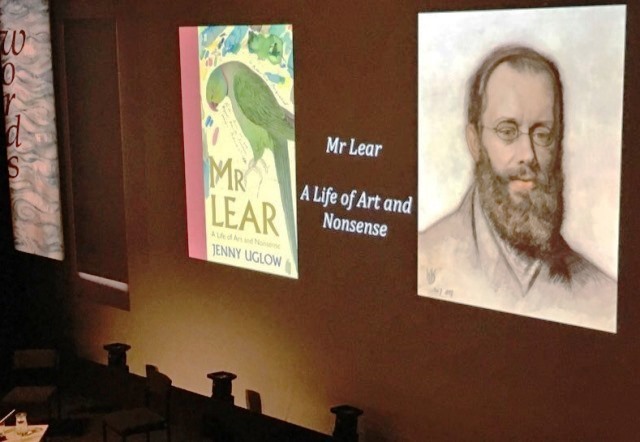 Afterwards, Zoe and Liz wanted to go back to the Theatre to hear a talk about a famous artist and poet called Mr Edward Lear, who not only painted wonderful botanical portraits of animals and birds, but also wrote ‘nonsense’ poems. He wrote one of my favourite poems, The Owl and The Pussycat. I was very tired by this time, so Zoe and Liz put me in the car to have a sleep while they went to the talk. 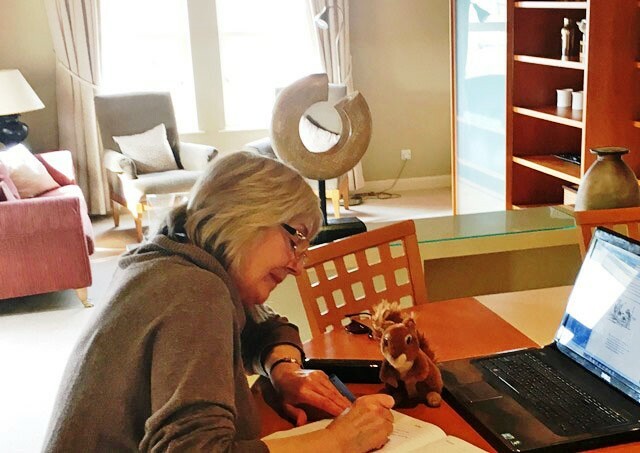 Many thanks to Liz McGillivray for writing out Oxley’s story. We had a lovely few days staying at Underscar, a timeshare property which also rents out its luxurious holiday cottages. Oxley is obviously very popular with the children who stay at Underscar. We enjoyed reading their accounts of days out with him, mostly enjoying walks in the Lake District hills. 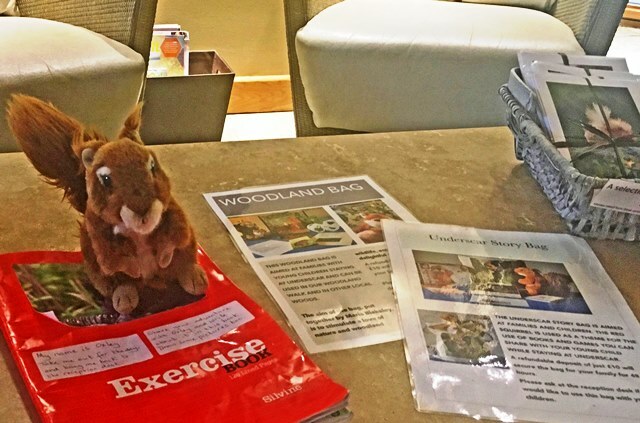 I love it when places think of quirky ways to keep kids occupied 🙂 It was great fun to take this cute furry squirrel out with us and show him a bit of culture, eating out and more lovely scenery! Wow! It seems really awesome place and great pictures of the Lake District. Thank you so much for sharing it. Yes, it’s very special place to stay. 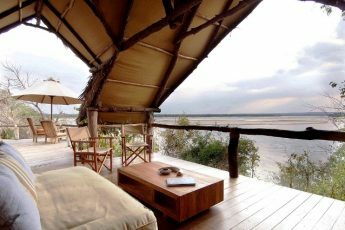 Not only is the accommodation top-notch but there’s a swimming pool, spa, restaurant and bar as well as lovely gardens and stunning views of the surrounding area. That squirrel looked very happy in the chocolate shop. Great way to engage children on their holiday. Looks like a nice apartment. 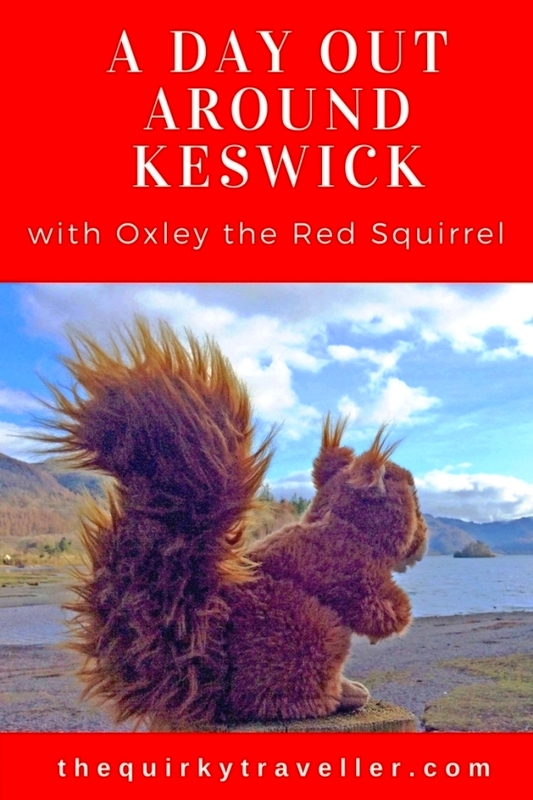 I really enjoyed your post and article about Keswick. What an interesting place Underscar is and pictures you captured beautifully. Thank you so much for sharing it. Love the article and pictures! I’m not surprised that Oxley slept during the talk about Edward Lear. He had had a very busy day and met so many people.